The island of Corsica on the Southeast of France offers some of the best beaches in the world. Its ideal weather, its fascinating 1000 km coastline, its gorgeous mountainous scenery and picturesque towns make Corsica the perfect holiday destination. The fishing villages of Erbalunga and the port at Porto provide a great setting for exploring the Gorges de la Spelunca and Aitone forests. The Parc Naturel Regional de Corse protects thousands of rare animal and plant species. It is not possible to reach the park on foot, but visitors can gain access by boat from the village of Galéria. Corsica, like all the other Mediterranean islands, was home to indigenous animals of the Pleistocene, some endemic to it and some to it and Sardinia. After the proliferation of man in the Mesolithic, these began to disappear. However it is now known that many species managed to survive the mesolithic, and many were still present well into historical times. Corsica has plenty of domestic animals like pigs, goats etc., and therefore Corsican food includes great bacon, ham, meat and sausage. The seafood is also very fresh and delicious. It should be noted here that the villages of Piana and Saint Antonino are listed among the most beautiful villages of France. Piana, founded in 1725, has several narrow streets, bars and boutiques. The road connecting Piana and Porto unwinds through a wonderful landscape called Calanche. The Calanche of Piana has strange rock formations and red cliffs that are sometimes very deep and plunge into the sea. It is believed that the rock formations that include a bishop, a dog and a shepherdess were carved by the devil himself. The Calanche is a UNESCO protected site. Corsica is believed to have been inhabited even in the Mesolithic period. After being held by the Greeks and later the Etruscans for brief periods, the region came under the Roman Empire. It was then the subject of disputes between the two republics of Pisa and Genoa. It came under the Genoese control in 1347 who held it till 1729, with the exception of 1553, when it was with the French. The Corsican revolution struggle, which originated in 1729, led to the forming of an independent Corsican state in 1775 under Pasquale Paoli, that lasted until 1768. The Republic, however, still had Genoese occupying major coastal cities. The Republic of Genoese secretly sold Corsica in 1764 to France. After the civil war of 1768 –69, Corsica joined France, thus ending its sovereignty. The town of Ajaccio on the west coast is well sought by tourists for its consistent warm climate throughout the year. The birthplace of Napoleon Bonaparte, now the National Bonaparte Museum, is also here and open for visits. The Renaissance cathedral, Notre Dame de la Misericorde is quite famous, as it was here that Napoleon Bonaparte was baptized. One can also take a boat trip from Ajaccio to the Isles Sanguinaires. On the Northeast is the port town of Bastia. The old port here, though not very active, has several jaded Venetian style buildings, which are quite a pretty sight. You can take a train from St. Nicholas and travel for 45 minutes through the main places of interests of the town. The town of Sartene is in the Southeastern part of the Propriano mountains. A notable fact for the buildings here is that they are built from the same rock on which they stand. Place de la Liberation, located in the towncenter, provides an excellent panoramic view of the area. Prehistoric sites, dolmen and menhirs can also be explored at Sartene. 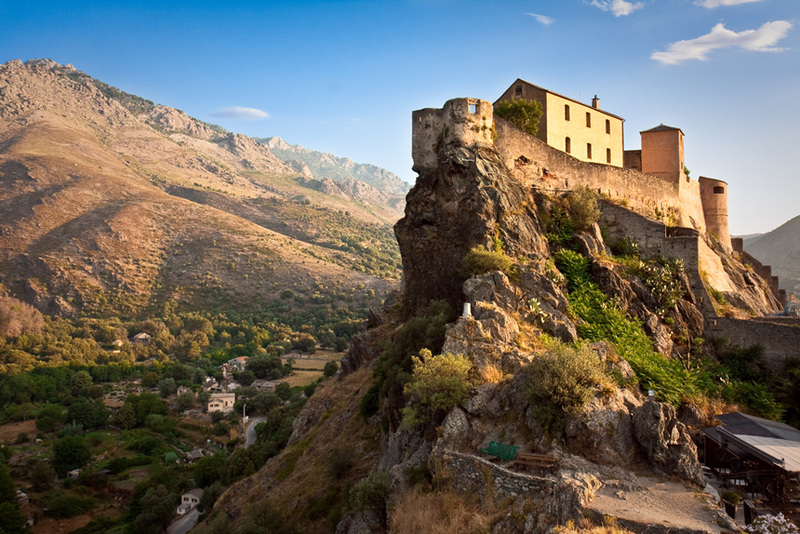 Corte, about 40 km east of Bastia, is another mountainous town. The citadel and the Museum of Corsica are important places of interest here. The citadel is located atop a large rock and can be reached by an uphill walk through the narrow streets, which are sometimes rather steep. The viewing platform close by provides a fascinating panorama of the surrounding mountains. It is easy to tour the town, as it is relatively small in size and all minor roads eventually lead or join the main road.